It might seem unlikely at first but Dubai has plenty to offer besides mall-crawling, gorging on mouthwatering Middle-Eastern cuisine and being wowed by its surreal cityscape and skyline. The activities and excursions we have lined up are aimed at thrill-seekers as well as those who want adventure sans thrills and spills. Here’s a heads-up. The high-flying traveller can literally reach for the sky because helicopters and seaplanes will take you up for an upside-down view of the city. That pretty Google-map-like image doesn’t come cheap but it’s a rare opportunity. The most popular mini-excursion includes desert safaris, complete with camel rides, quad bike rides and belly dancing shows. 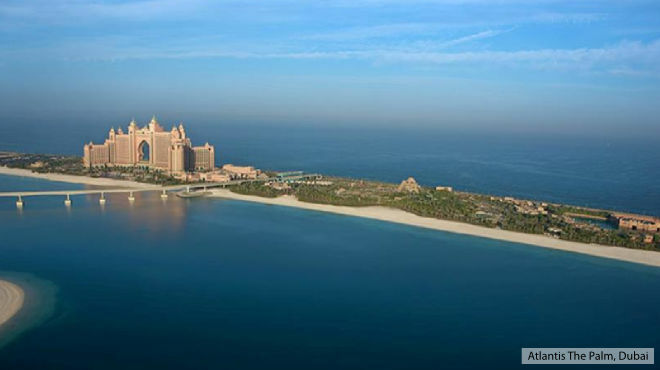 Dubai is a bejewelled wonder in the Arabian Desert, and a night in the sand dunes is an unforgettable experience. For those who crave something more extreme, worry not. Fly-boarding and scuba diving will give you the fix you’re after. So buckle up and prepare for an exciting ride! Desert Safari : Tour operators will take you on a desert safari on the outskirts of the city, which can range from a day trip to a more comprehensive, overnight safari. These excursions include ‘dune bashing’, which aptly describes a very, very bumpy ride across the dunes in a 4-wheel drive. After this bone-crusher, you will be driven to a campsite, where refreshments are accompanied by a belly dancing show. A short camel ride is also thrown in for good measure. For those who are keen on an Arabian Nights feel, an overnight safari is recommended. Here, apart from camels and dune buggies, you will spend the night at a Bedouin-style campsite, where the décor and hospitality is as Arabian as the 21st century will allow. Spending the night under the stars is a first for most visitors and is a thoroughly refreshing experience. There are many variations of a ‘desert safari’ and tour operators will customise yours depending on the activities you prefer. Here are some adrenaline-pumping elements you can throw into the mix: quad biking, dune buggy safari, sandboarding and falconry. Hot Air Ballooning : Floating across the skies on a magic carpet means taking a ride in a hot air balloon at Al Ain. A very popular excursion among all age groups, hot air ballooning offers a breathtaking view of the desert landscape – endless sand dunes with a smattering of oases, and animals such as oryx, gazelle making their way across the golden sands. Rise early and you will catch a spectacular sunrise set against the backdrop of the Hajjar Mountains. These are memories that will stay with you forever. Fly Boarding : It’s crazy, it’s extreme and it’s not everyone’s cup of tea. Yet fly-boarding is becoming increasingly popular among young people for the pure adrenaline rush it offers. Wearing special shoes attached to a small platform that shoots jets of water from under your feet, you can ‘fly’ above the water, turn backflips as you go or dive like a dolphin. Scuba Diving : This is a much gentler way to explore the wonders of the sea. The warm tropical waters on the Arabian coast provide the perfect habitat for colourful coral reefs, small and brightly coloured fish such as blennies and lionfish, and even black-tip reef sharks. Depending on where you dive, you could chance upon a page from the past by exploring a sunken shipwreck. Popular diving sites include Dubai, Abu Dhabi, and Sharjah, Ras Al Khaimah, Fujairah, Khor Fakkan, Dibba and Musandam in Oman. Tour operators customise excursions, which could last a few hours or even days. Horse Riding : The Arabians have a tradition with thoroughbred horses and it’s only natural for Dubai to offer visitors a taste of this exciting pastime. So, for a few hours, saddle up and indulge yourself with an engaging ride at Al Qusais. There are many ways to enjoy the sapphire waters of the Persian Gulf. You could take a traditional dhow cruise – either a short ride up and down the Dubai creek or a 2-hour dinner cruise – and waft back in time. If you prefer a tour of some of Dubai’s coastal marvels – The Palm Jumeira, Royal Palaces, Atlantis The Palm and the Burj Al Arab – you could hop on to a high-speed ‘yellow boat’ at the Dubai Marina Walk. If you can’t resist the call of the sea, then you must take the Dubai Marina Cruise at the Dubai Marina Yacht Club. More like a floating, ultra-modern restaurant, this cruise treats guests to 2 hours of super-luxury. There’s a five-star buffet to savour as you gently cruise past the Dubai Marina, Mina Seyahi Lagoon and Palm Crescent. And, finally, for the more adventurous, there’s a four-hour, deep-sea fishing adventure up for grabs. Toss a line and keep your fingers crossed for the Gulf waters are known for salt-water monsters!